MJM Magic can help launch your magic career, or simply help expose your name and products to our large audience! We have been in the magic industry since 2004, so we've built quite the reputation for being a ONE STOP Magic Shop that you can trust. Therefore, if you have an effect that you want to sell, and you want it exposed to the tens of thousands of customers, then we are here to help you! SUBMIT YOUR EFFECT TO US! We love promoting new magic. Whether you have a digital download, or a physical product that you want to sell, we have the resources to help you make your dream come true! In addition to being featured on our website, we promote your item for free on our Facebook and Twitter pages too! Get the exposure you need at no cost to you! HOW TO SUBMIT A DIGITAL DOWNLOAD? Many effects these days can be produced cheaply. In fact, gone are the days where you needed to have a physical DVD to sell something. 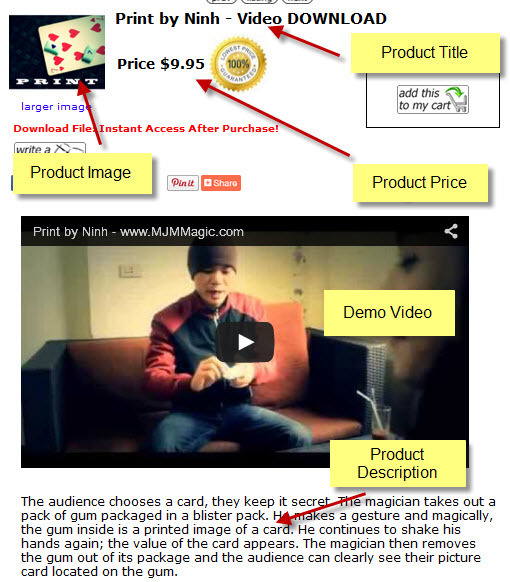 So as long as you have a decent camera, you can now market your magic effects under our Downloads Area here at MJM Magic! 1. (Optional) Film a demo video of your effect. This is what you want customers to see and advertise your effect. It's not mandatory to have a demo video, but from our experience, it greatly improves the sales of your product if customers can see what the effect is all about. 2. Film an explanational video. This is the video (or product) that your customers will receive when they purchase your effect. It will teach them how to perform your effect. The better and more detailed your video is, the better reviews it will get.......and that means more sales and money that you will earn! 3. Submit a Product Image for your item. This is what customers will see when they find your product on our website. Format can be a JPG or IMG file. 4. Write up a product description. This is what we will display on your products page, allowing customers to read what your effect is about. This is where you can get creative and really try to SELL your effect! 5. Finally, tell us the price that you want to sell it for! You will earn 50% on everything that sells, while we handle all the sales, distribution, web hosting, and customer service. It's that easy! Whenever you have a new effect, simply email us those five things, and we will put it on the MJM Magic website where it will be seen by thousands of people! You simply sit back and cash out your earnings anytime you wish! If you have a physical item that you want to sell in our store, it's just as easy to sell it here at MJM Magic! Whether it's a DVD, a certain gimmick, or anything that needs to be MAILED to customers, MJM Magic can act as your FULFILLMENT CENTER. We handle EVERYTHING so you don't have to! 1. Simply send us an email and tell us that you have a physical item that you want to sell in our store. 2. Be sure to give us a Demo Video (optional), Product Image, a Product Description, and the Retail Price that you want to sell it for. 3. Send the physical product to us. Just like Amazon, we will be your FULFILLMENT CENTER. You send however many units you want to our store, and we will store, sell, and distribute them for you. We do all the work so you don't have to! For example, let's say that you have produced an effect, and you and you want to advertise it here at MJM Magic. Simply send us however many units you want us to sell, and we will keep your inventory safe in our stockroom. No need for you to keep boxes of stuff at your place, having to waste your time sending individual orders out. LET US DO THAT FOR YOU! When a customer purchases your item from our store, we will handle all the shipping charges and make sure they get YOUR product! You sit back and collect 50% of whatever sells, simply by doing nothing! All you have to do is send your item to us, and we handle everything else! WE DON'T MAKE MONEY UNLESS YOU MAKE MONEY! It costs you nothing, and we do all the work! Cash out your commissions at ANY TIME! You earn when we sell, and if your product sits on our shelves, then it's no big deal because we keep it safe on our shelves. Let MJM Magic help you out with your creation! We don't care of your a seasoned professional, or an amateur who created an effect on your webcam! If you can do the steps above, we can help you out!